The First Epistle of John is a book of the Bible New Testament, the fourth of the "catholic" or general epistles. It was probably written in Ephesus about 90-110 C.E. and is more a sermon than a letter. The author's purpose is to counter the heresy that Jesus did not come "in the flesh" but only as a spirit, together with a possibly related teaching that Christians were free from normal ethical constraints. Purportedly by the same author or authors who wrote the Gospel of John and the other two epistles of John, the First Epistle of John echoes the language and several of the themes of the Gospel of John, but scholars are divided as to whether it is actually by the same author or by someone writing in the same tradition. Neither the Gospel nor the epistle specifies an author's name. 1 John contains a number of memorable passages, such as the famous dictum, "God is love," and the warning that "If we claim to be without sin, we deceive ourselves." It also contains the first known use of the word "antichrist," but uses it to describe teachers who deny that Jesus had come in the flesh, not to indicate a single satanic leader or false prophet. Some translations of the letter also contain a famous trinitarian verse known as the Comma Johanneum, once widely used to justify the doctrine of the Trinity, but today believed to be a later addition, due to its absence from the earliest biblical manuscripts. The Apostle John, writing under the Holy Spirit's inspiration. The author declares that his purpose in writing is so that his readers will not sin. However, if they do sin, Christ atones for them. Yet, to know Christ, one must obey his commands. One cannot hate one's brother and walk in the light. The writer contrasts God to "the world," which is full of evil and temptation. He goes on to expose anyone who denies that Jesus is the Christ as a liar and "the antichrist." (2:22) However, "whoever acknowledges the Son has the Father also." About such issues, certain unnamed teachers "are trying to lead you astray." Moreover, if we love one another, "God lives in us and His love is made complete in us." This is because "God is love." (4:16) In love there is no fear, and perfect love casts out fear. The reason Christians love God is because God first loved them by sending his Son as a sacrifice for our sins. Once again the reader is reminded that he cannot hate his brother and truly say that he loves God. In order to overcome "the world," one must believe that Jesus is Christ (the Messiah), and "everyone who believes that Jesus is the Christ is born of God." One must obey his commandments, but these are not burdensome. Christ came "by the water and blood," not water only—a possible reference to the eucharist as being just as essential as baptism. Moreover he is testified to by a trinity found nowhere else in Christian scriptures: "the Spirit, the water, and the blood." In concluding, the author returns to his main theme: "anyone born of God does not continue to sin." His final word, however, introduces a new subject, namely that Christians must stay away from idols. 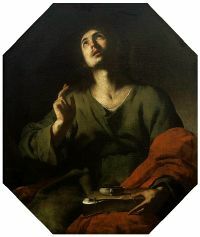 The Apostle John as a young man. Traditionally, the epistles of John are believed to have been written when the apostle had reached an advanced age. The epistle is traditionally held to have been written by John the Evangelist, also known as John the son of Zebedee, probably at Ephesus when the writer was in advanced age. The epistle's content, language and conceptual style are an indication that a common authorship existed between this letter and the two other letters attributed to the Apostle John. Theologically and stylistically, it also resembles the Gospel of John, although some commentators attribute it to style of the "Johannine community" rather than to the same author. Although church tradition starting with the Council of Rome in 382 C.E. made a distinction between the author of the Gospel of John and 1 John on one hand and the 2 John and 3 John on the other, modern scholars often see them as connected. For example, once commentator wrote that: "The three Epistles and the Gospel of John are so closely allied in diction, style, and general outlook that the burden of proof lies with the person who would deny their common authorship" (Streeter, 1925, p. 460). In answer to this challenge, several points are usually cited. First, the letter does not specifically claim to be written by John, although it certainly implies that he is the author. Second, there are important stylistic differences between the letter and Gospel. Linguistic experts point out that the letter lacks the Semitic qualities founding the Gospel and that, unlike any other writing of similar or greater length in the New Testament, it contains not a single quotation from the Old Testament (Shepherd, 1971). The letter also lacks several key themes in the Gospel, such as the resurrection, the final judgment, God's kingdom, peace, grace, and glory. Moreover, in the Gospel, it is the Holy Spirit that is the promised "advocate," or "counselor" (John 14:16, 26) but in the letter it is Christ (1 John 2:1). Those who suggest that someone other than John wrote the epistle theorize that the author was consciously using the literary style, certain concepts, and several direct phrases borrowed from the Gospel of John, especially such ideas as "he who has the son has the Father," being "born of God," walking in the light and Jesus' commandment to "love one another." Some believe it to have been the product of the Johannine community of which the Apostle John was once a part. Regarding its date, nearly all agree that is a relatively late work. Traditionally, John was believed to have been the youngest of the disciples, and to have lived a very long life. Indeed, the repetitiveness and apparently wandering of the mind of the writer may indicate that he was of advanced age. The latest it could have been written was 117 C.E., for Polycarp, the bishop of Smyrna, cites it around that time. The late first or early second century is thus a likely range for its date of composition. Although the author speaks of such purposes wanting the joy of his audience would "be full" (1:4) and that they would "not sin," he was specifically concerned about heretical teachers that had been influencing churches under his care. He denounces these teachers as antichrists (2.18-19) who had once been church members, possibly even leaders. Two heresies are apparently involved. The first is Antinomianism, the idea that in being baptized, Christians are freed from all sin and that supposedly immoral acts, such as sexual relationships outside of marriage, are no longer sinful when one truly knows Christ and abides in God's love. A second heresy which the writer denounces is Docetism, the notion that since the flesh is evil and the spirit is good, Jesus did not actually possess a body of flesh, but was a purely spiritual being who only appeared to have a physical body. Both of these doctines—Aninomianism and Docetism—were taught by certain Gnostic sects. Some suggest that John might been criticizing the teachings of a specific heretic known as Cerinthus. According to the second century writer Bishop Irenaeus of Lyon, Cerinthus was one of the first Gnostics, who taught that the world was not made by God the Father, but by an inferior being, and that the "Christ" descended on Jesus at his baptism and returned to God after Jesus' death. The First Epistle of John contains several memorable passages that have inspired Christians throughout the ages. Perhaps the most famous of these is the simple saying, "God is love." 1 John has also been influential on Christian doctrine. Its teachings on the universality of sin—for example, "If we claim to be without sin, we deceive ourselves and the truth is not in us" (1:8)—helped mold the doctrine of Original Sin as promulgated especially by Saint Augustine of Hippo. Its emphasis on the incarnation was also influential, both in rejecting the idea that Jesus only appeared to be a human being with a body of flesh and promoting the doctrine that Jesus was indeed God's divine Son. Its use of the word "antichrist" to describe anyone who denies "that Jesus Christ has come in the flesh" was adopted in later generations to refer to the "Beast" of the Book of Revelation and the "man of perdition" of 2 Thessalonians. One of the most controversial verses of the Bible is an explicit reference to the Trinity in some editions of (1 John 5:7), known as the Comma Johanneum, "comma" meaning simply a short phrase. The King James Version of the English Bible, for example, reads: "For there are three that bear record in heaven, the Father, the Word, and the Holy Ghost: and these three are one." However, the verse does not appear in the earliest biblical manuscripts, and most scholars today consider it to be a later addition, inserted to balance 1 John's next verse: "There are three that bear witness in earth, the Spirit, and the water, and the blood." Few scholars today defend the Comma as authentic, and the Catholic Church warns that it must not be relied upon in defending the doctrine of the Trinity. The majority of modern translations (for example New International Version, English Standard Version and New American Standard Bible,) do not include this text, but may refer to it in a footnote. Shepherd, Massey H., Jr. "The First Letter of John." in Laymon, Charles M. The Interpreter’s One-Volume Commentary on the Bible. Abingdon Press, 1971. 1 John, King James Version Online Bible. History of "First Epistle of John"
This page was last modified on 26 September 2018, at 16:48.